The effect of topical lidocaine plus dexamethasone on postoperative analgesia in septoplasty surgery. Introduction: This study has aimed to research the analgesic effects of lidocaine and dexamethasone infiltration in the merocel pack which is being used as nose pack for patients who had septoplasty operation. Materials and methods: Sixty patients are included in randomized double blind study. The patients are divided into 3 groups as lidocaine (group L), lidocaine + dexamethasone (group LD) and dexamethasone (group D). The prepared medications are infiltrated in Merocel Pack that has been placed in both nostrils after the operation. The NRS impacts and side effects are examined in postoperative 15th minute and 1st, 2nd, 4th, 8th, 12th and 24th hours. Moreover, the total tramadol consumption between hours 0-1, 0-12 and 12-24 are recorded. Results: The study is finalized with 57 patients. The postoperative patients satisfaction did not demonstrate a significant difference among the groups by means of NRS levels. 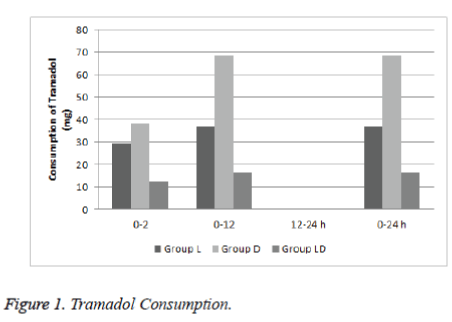 Group D has consumed more analgesics than group LD in the first 12 hours with regards to the total tramadol consumption. Conclusion: We observed that lidocaine or dexamethasone infiltrated in Merocel Pack provides analgesic effects for pain control following septoplasty whereas the total analgesia consumption is reduced when dexamethasone is combined with lidocaine. Septoplasty, Topical lidocaine, Topical dexamethasone. The septoplasty operation is one of the frequent operations performed in head and neck surgery. Postoperative pain is an important issue in these operations and negatively affects the patients comfort and the length of hospital stay . In addition to the surgical pain, the pain due to pack placement is also a frequent complication . The nasal pack application is performed to control the bleeding, to prevent the adherences in postoperative period and to fix the bones and the cartilages [3,4]. The lidocaine is a local analgesic of which analgesic activity has been proven in different forms of administration . The glucocorticoids are known with their analgesic and antiemetic characteristics as well as their strong anti-inflammatory effects. It has been reported that it increased the effectiveness of dexamethasone in combination for this purpose alone or with other analgesics [6-8]. In this study, we aimed to investigate the analgesic effects of lidocaine and dexamethasone infiltration in the merocel nose pack used in patients who had undergone septoplasty operation. Following the approval of the local ethics committee; this study included 60 ASA I-II patients aged between 18 and 75 years who were scheduled for elective septoplasty operation in Abant Izzet Baysal University Hospital. Patients with known allergy against the study drugs, history of chronic use of analgesics, antiepileptic, antidepressant and glucocorticosteroid, and patients having respiratory, liver and renal diseases, morbid obese, pregnant and lactating patients were excluded. All patients were informed about 11 point Numeric Rating Sale (NRS) for pain assessment (i.e. 0: no pain and 10: worst pain) during the preoperative visits.. Patients were randomly divided into 3 groups as lidocaine (group L), lidocaine + dexamethasone (group LD) and dexamethasone (group D) by the computer. Merocel Packs were applied in both nasal cavities of patients at the end of surgery and packs were removed at 24th postoperative hour. Merocel packs are hydroxylated polyvinyl acetate packs which expand in contact with fluid. The computer-generated randomisation list was delivered to a nurse who was unaware of the study. The agents used in the study were prepared before the surgery by this nurse..
Group L (Lidocaine group): 10 ml 2% Lidocaine (Aritmal amp. 2% 100 mg/5 ml, Osel ilaç/ İstanbul) + 2 ml SF (Serum Physiological, 0.9% NaCl). Group LD (Lidocaine+dexamethasone group): 10 ml 2% Lidocaine and 2 ml dexamethasone (Dekort amp. 2 ml/ 8 mg, Deva Holding/İstanbul). Group D (Dexamethasone group): 2 ml dexamethasone + 10 ml SF (Serum Physiological, 0.9% NaCl). The patients were taken in the operation room and 20 G intravenous (i.v.) cannula was placed. The heart rate (HR), non-invasive blood pressure (NIBP) and pulse oximetry (SpO2) were monitored in standard for all the patients. Anesthesia was induced with 2 mg.kg−1 propofol followed by 0.6 mg/kg rocuronium to facilitate orotracheal intubation. One minute after the propofol injection, a 1 μg kg min initial dose of remifentanil was given over 60 s. Orotracheal intubation was performed following adequate muscle relaxation. Remifentanil infusion was decreased to 0.5 mg/min. The patients were connected to mechanical ventilator to maintain anesthesia in O2 as 1-2% MAC sevoflouran and 65% N2O for 3 L min fresh gas flow achievement. The remifentanil infusion was titrated to maintain the mean arterial pressure (MAP) 65-100 mmHg. It was planned to increase the fluid infusion when the MAP reduces less than 60 mmHg. The remifentanil infusion was decided to stop, if hypotension occurre and ephedrine hydrochloride 10 mg (Ephedrine 0.05 mg/ml, Osel) i.v. was given. Additonally, in case of bradycardia, i.v. atropine sulphate (Atropine Sulp. 1 mg/ml, Galen) 0.5 mg was given. Only the two surgeons performed all the operations. The prepared drug combinations were applied by the study team at the end of surgery. The contents were injected in 6 ml in each Merocel Packs which were placed in both nasal cavities. After skin closure, remifentanil infusion and sevoflurane were discontinued, and residual neuromuscular blockade was antagonized with neostigmine 40 mcg kg and atropine 0.15 mg/kg. Extubation was performed when patients responded to the verbal commands and spontaneous respiratory rate exceeded 12 breaths/min. The total duration of surgery and haemodynamic data were recorded. Contramal 1 mg/kg (Contramal 50 mg/ml, Abdi İbrahim) was planned as the rescue analgesic in postoperative period in case the NRS value >4. Postoperative nausea and vomiting were treated with the ondansetron HCL (Zofran 4 mg/2 ml, GlaxoSmithKline) 4 mg i.v. Within 10 minutes of the tracheal extubation, the patients were transferred to postoperative care unit (PACU) and patients remained in the unit for 1 hour. The postoperative 15th minute was accepted as 0 hour. The visits were performed and scores were recorded at hours 1, 2, 4, 8, 12 and 24. The NRS scores, side effects (nausea, vomiting, dizziness, seeing blurring, headache, loss of concentration, itching and other) and the total tramadol consumption were recorded for the periods between 0-1, 0-12, 12-24 hours. Additionally, patient satisfaction (Excellent: 3, Well: 2, Moderate: 1, Poor: 1) was assessed. The data was performed using Statistical Package for Social Science (SPSS 15.0) program. The Kolmogorov-Smirnov test was used to determine the normal distribution of the continuous variables. The homogeneousness of the variances was tested with Levene test. The data were demonstrated as mean ± standard deviation for continuous variables (e.g. age, AAP, ASA, duration of surgery) whereas the nominal variables are shown with numbers of occurrences. The significance of the difference among the group means was analysed with oneway ANOVA (uni-directional variance analysis). Kruskal Wallis test was used for understanding the significance of difference through the median values. Pearson’s chi-square, Fisher’s finalized chi-square or possibility ratio test have been used for examining the nominal variables. A p value less than 0.05 was considered statistically significant. The study was completed with 57 patients. Two patients required additional procedures and one patient refused to participate in the study. No complications were recorded in the study. The demographic characteristics were similar among the groups (Table 1). Additionally, when the postoperative patient satisfaction levels were compared, no statistically significant difference was detected among the groups (Table 2). Also, the groups were similar in terms of postoperative NRS levels and NRS levels were low in all groups (Table 3). Cumulative tramadol consumption was significantly lower in group LD in the first 12 postoperative hours than in group D (p<0.009) (Table 4 and Figure 1). Values are expressed as mean (SD) or n (%). Table 1. Demographics and Clinical Characteristics of the patients. Table 2. Patient Satisfaction Levels. This prospective, randomized double blind study showed that the lidocaine, dexamethasone or lidocaine-dexamethasone combination applied in Merocel pack reduced the NRS scores. Moreover, the dexamethasone which was added as adjuvant to the lidocaine has reduced the total tramadol consumption. Septoplasty operations are frequently performed procedures. Due to painful surgical procedure, postoperative analgesia and pain management is important after septoplasty . In addition to pain induced by surgery, the nasal tampons used for bleeding control, for postoperative stabilization of cartilage and bone tissue and prevention of adherences may also cause postoperative pain in septoplasty [10,11]. Despite the use of various analgesics and methods, successful results may not be achieved in controlling postoperative pain . The nonsteroid inflammatory drugs, local anesthetic agents have been used alone or in combination with each other through different methods and routes (intravenously, patient controlled anaesthesia, in packs) [8,13,14]. The combination of medicines has aimed to minimize the complications and to obtain the maximum benefit with minimum dose . Karaman et al. investigated the effects of 2.5 ml of 0.25% bupivacaine, 0.375% ropivacaine, 1% lidocaine + 0.000625% adrenalin solution soaked in Merocel nasal packs on hemorrhage and pain after septoplasty. They concluded that bupivacaine use in nasal surgery provides better analgesia at least in the first 8 h period and also bupivacaine, ropivacaine and lidocaine plus adrenalin are all effective at controlling pain after septoplasty. Demirhan et al. conducted a study in which they compared pregabalin and dexamethasone for postoperative pain treatment in septoplasy. They showed that pregabalin or pregabalin plus dexamethasone improved early pain control and decreased tramadol consumption within the postoperative period after septoplasty. They also mentioned that at the 0 and the 2nd hour NRS scores of patients received pregabalin and dexamethasone were significantly lower in control group patients. Şener et al. compared four different NSAI medicines for the treatment of acute postoperative pain in septoplasty. It was showed that the control group required more opioids compared to the other groups. The authors concluded that despite the use of opioids, the average visual analogue scale score in the first 8 h was 30 mm or above. Similarly in our study NRS scores of patients received lidocaine and dexamethasone were found to be low and analgesic regimen of our study provided adequate and effective analgesia. All these studies discussed above remind us the importance of pain treatment in septoplasty. Because of this, we did not use a control group in our study. The local analgesics have been used in the nasal packs used for septoplasty [14,17,18]. Apuhan et al. reported that levobupivacaine and prilocaine infiltration without removal of the packs was increased the patient comfort. Karaaslan et al. had performed a study in which they compared prilocaine and meperidine without pack removal and reported an achievement of sufficient analgesic impacts. Lidocaine is member of amid group local anesthetics with intermediate duration of efficacy. It has the ability to penetrate the tissues rapidly . In topical use of lidocaine, the sufficient contact of the agent with the mucosa can provide sufficient level of analgesia for different kinds of surgical procedures [19,20]. Yılmaz et al. reported that lidocaine administered before the removal of the packs had significantly reduced the pain. Sahin et al. conducted a study investigating the effect of lidocaine infiltration in nasal packs on patient anxiety and they reported that the lidocaine infiltration decreased the pain scores significantly. Similarly, in our study infiltrating lidocaine in Merocel Packs provided effective analgesia in patients. The dexamethasone is a potent synthetic corticosteroid with strong anti-inflammatory effect, analgesic and antiemetic activities [22-24]. The dexamethasone has been added to local anesthetic agents as an adjuvant in different surgical procedures [25,26]. In different studies it was reported that dexamethasone may extend the duration of anesthesia and may decrease the postoperative rescue analgesic needs [7,25,27]. Eftekharian et al. reported that 8 mg iv dexamethasone used in anesthesia induction decreased significantly the postoperative pain. Kaygusuz et al. used topical dexamethasone, bupivacaine and lidocaine sprays for postoperative pain treatment in tonsillectomy. They reported that bupivacaine, dexamethasone and lidocaine nasal aerosol decreased the pain significantly in the first postoperative day when it was compared with the control group. They concluded that these agents might be used to reduce pain in the early period after tonsillectomy. As far as we know, there is no study to investigate the topical use of dexamethasone for septoplasty in the literature. In the present study, we found that dexamethasone infiltrated in Merocal packs reduced the pain scores. Additionally, dexamethasone added to lidocaine may reduce the rescue analgesic requirements. As a conclusion, we observed that lidocaine or dexamethasone infiltrated in Merocel packs provides effective analgesia and can be used to treat postoperative pain in septoplasty. Additionally, the combination of dexamethasone with lidocaine reduces total analgesic consumption. White PF. The changing role of non-opioid analgesic techniques in the management of postoperative pain. Anesthesia & Analgesia 2005; 101: S5-S22. Fairbanks DN. Complications of nasal packing. Otolaryngol Head Neck Surg 1986; 94: 412-415. Weber R, Hochapfel F, Draf W. Packing and stents in endonasal surgery. Rhinology 2000; 38: 49-62. Yıldırım A. Endonazal Cerrahide Burun İçi Tamponlama Mutlak Gerekli midir. Cumhuriyet Medical Journal 2003; 25: 47-50. Yilmaz YF, Özlügedik S, Titiz A, Tuncay A, Ünal A.Septoplasti Sonrasi TamponÇekilmesi Esnasinda Tampon Içine Lidokain Infiltrasyonunun Oluşan Ağri Üzerine Etkisi.KBB-Forum 2008;7(1). Kehlet H. Glucocorticoids for peri-operative analgesia: how far are we from generalrecommendations? Acta Anaesthesiol Scand 2007; 51: 1133-1135. Parrington SJ, O'Donnell D, Chan VW, Brown-Shreves D, Subramanyam R, Qu M, Brull R. Dexamethasone added to mepivacaine prolongs the duration of analgesia after supraclavicular brachial plexus blockade. Reg Anesth Pain Med 2010; 35: 422-426. Demirhan A, Akkaya A, Tekelioglu UY, Apuhan T, Bilgi M, Yurttas V, Bayir H, Yildiz I, Gok U, Kocoglu H. Effect of pregabalin and dexamethasone on postoperative analgesia after septoplasty. Pain Res Treat 2014; 2014: 850794. Sommer M, Geurts JW, Stessel B, Kessels AG, Peters ML, Patijn J, van Kleef M, Kremer B,Marcus MA. Prevalence and predictors of postoperative pain after ear, nose, and throat surgery. Arch Otolaryngol Head Neck Surg 2009; 135: 124-130. Weber R, Keerl R, Hochapfel F, Draf W,Toffel PH. Packing in endonasal surgery. Am J Otolaryngol 2001; 22: 306-320. Yildirim A, Yaşar M, Kocatürk S, Kunt T. Septum Cerrahisi Sonrasinda İnternal Nazal Splint İle Burun İçi Tampon Kullaniminin Östaki Tüpü Fonksiyonuna Etkisinin Karşilaştirilmasi. KBB-Forum 2004; 3. Rathmell JP, Wu CL, Sinatra RS, Ballantyne JC, Ginsberg B, Gordon DB, Liu SS, Perkins FM, Reuben SS, Rosenquist RW,Viscusi ER. Acute post-surgical pain management: a critical appraisal of current practice, December 2-4, 2005. Reg Anesth Pain Med 2006; 31: 1-42. White PF. Multimodal analgesia: its role in preventing postoperative pain. Curr Opin Investig Drugs 2008; 9: 76-82. Karaman E, Gungor G, Alimoglu Y, Kilic E, Tarakci E, Bozkurt P,Enver O. The effect of lidocaine, bupivacaine and ropivacaine in nasal packs on pain and hemorrhage after septoplasty. Eur Arch Otorhinolaryngol 2011; 268: 685-689. Kehlet H,Dahl JB. The value of "multimodal" or "balanced analgesia" in postoperative pain treatment. Anesth Analg 1993; 77: 1048-1056. Sener M, Yilmazer C, Yilmaz I, Bozdogan N, Ozer C, Donmez A,Arslan G. Efficacy of lornoxicam for acute postoperative pain relief after septoplasty: a comparison with diclofenac, ketoprofen, and dipyrone. J Clin Anesth 2008; 20: 103-108. Apuhan T, Yildirim YS, Gulcu N, Kocoglu H,Karagoz Y. The effect of prilocaine or levobupivacaine infiltration on pain during nasal packing removal. Otolaryngol Head Neck Surg 2011; 145: 418-421. Karaaslan K, Yilmaz F, Gulcu N, Yigit B,Kocoglu H. The effect of prilocaine and prilocaine plus meperidine infiltration on the pain during nasal packing removal. Rhinology 2007; 45: 321-324. Chuang LH, Yeung L, Ku WC, Yang KJ,Lai CC. Safety and efficacy of topical anesthesia combined with a lower concentration of intracameral lidocaine in phacoemulsification: paired human eye study. J Cataract Refract Surg 2007; 33: 293-296. Di Donato A, Fontana C, Lancia F, Di Giorgio K, Reali S,Caricati A. Levobupivacaine 0.75% vs. lidocaine 4% for topical anaesthesia: a clinical comparison in cataract surgery. Eur J Anaesthesiol 2007; 24: 438-440. Sahin C,Aras HI. Effect on patient anxiety of lidocaine infiltration into nasal packing after septoplasty: prospective, controlled study. J Laryngol Otol 2015; 129: 784-787. Ramesh G, Meisner OC,Philipp MT. Anti-inflammatory effects of dexamethasone and meloxicam on Borrelia burgdorferi-induced inflammation in neuronal cultures of dorsal root ganglia and myelinating cells of the peripheral nervous system. J Neuroinflammation 2015; 12: 240. Kosaka Y, Tanino H, Sengoku N, Minatani N, Kikuchi M, Nishimiya H, Waraya M, Katoh H, Enomoto T, Sato T, Kuranami M,Watanabe M. Phase II randomized, controlled trial of 1 day versus 3 days of dexamethasone combined with palonosetron and aprepitant to prevent nausea and vomiting in Japanese breast cancer patients receiving anthracycline-based chemotherapy. Support Care Cancer 2016; 24: 1405-1411. Akkaya A, Yildiz I, Tekelioglu UY, Demirhan A, Bayir H, Ozlu T, Bilgi M,Kocoglu H. Dexamethasone added to levobupivacaine in ultrasound-guided tranversus abdominis plain block increased the duration of postoperative analgesia after caesarean section: a randomized, double blind, controlled trial. Eur Rev Med Pharmacol Sci 2014; 18: 717-722. Gao W, Ren Y,Cui GX. Dexamethasone added to local lidocaine for infiltration along the spinal-epidural needle pathway decreases incidence and severity of backache after gynecological surgery. Med Sci Monit 2015; 21: 821-827. Hong JY, Han SW, Kim WO, Kim EJ,Kil HK. Effect of dexamethasone in combination with caudal analgesia on postoperative pain control in day-case paediatric orchiopexy. Br J Anaesth 2010; 105: 506-510. Eftekharian A,Roozbahany NA. Use of intravenous steroids at induction of anesthesia for septoplasty to reduce post-operative nausea and vomiting and pain: a double-blind randomized controlled trial. Indian J Otolaryngol Head Neck Surg 2013; 65: 216-219. Kaygusuz I,Susaman N. The effects of dexamethasone, bupivacaine and topical lidocaine spray on pain after tonsillectomy. Int J Pediatr Otorhinolaryngol 2003; 67: 737-742.